In yesterday’s release of the 2nd quarter 2011 GDP numbers for the U.S., the BEA also revised some past numbers. This is not an unusual event. It’s routine. But the news and revisions this year were disturbing and sobering. First, a little about how GDP numbers are reported. In this day and age of instant info when stock markets report numbers within seconds, we tend to think we should get all our data that quickly. But it’s a really tough job. Think about it. GDP is the total market value of all the goods and services produced in a period of time. For the U.S., that’s a lot of stuff. There’s over 300 million of us buying things, making things, providing services, etc. The BEA has to add all that up. Actually it’s got to find out what we did before it can add them up. Some of the activity must be estimated. Hard data on a lot of production isn’t even available until months or even years afterward. In addition, to estimate real GDP from nominal GDP (nominal is what’s observable at current prices), they have to collect immense data on prices of nearly everything. Looked at this way,they do a pretty good job. So what happens is that each quarter they release three “estimates” of GDP and growth rates. The first version is released at the end of the month after the quarter closes. This is the “advance” estimate. That’s what we got yesterday, on July 29, for the quarter ending June 30. Next month in late August they will issue a revision of this number based on more and better information. Then in late September comes the “final” estimate based on even better analyses. Then they start over in October with the 3rd quarter “advance” estimate, etc. But in July each year, the BEA takes the opportunity to revise any of the data for the previous year, and at times for several previous years. There’s nothing sinister here, just more time allows a better, more precise estimate. And that brings me to yesterday’s news. 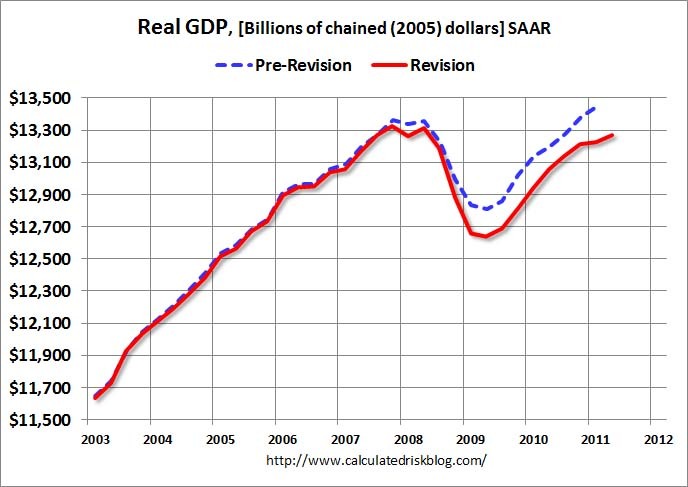 The following graph shows the current estimate of real GDP and the pre-revision estimate (blue). I’ll have more later on GDP. The revisions also mean (as the graph shows) that we aren’t back to where we were in 4th quarter 2007 yet. In other words, it’s almost four years after the recession began and we still have an economy that’s producing less goods and services than we did back then. Keep in mind that our population is close to 3.5% larger now than it was then. Kind of explains the bad the feelings you’ve been having, huh? Another implication of the revision is that it clearly shows that the government policy response has been grossly inadequate. The Obama stimulus program, which was clearly too small to deal with even the recession as we thought it was then, was definitely much, much too little. Given what we now know of the size and scope of the recession, the government stimulus program needed to be at least twice, perhaps three times, as big as it was. And, it needed to be more focused on stimulating demand through actual spending instead of having 40% of the money be tax cuts that wouldn’t be saved and wouldn’t help the economy. Finally, a perusal of the graph shows us two things. First, we lopped off a big chunk of the economy in 2007-09. That’s lost opportunity. It’s lost income. And it’s the 10%+ unemployment rate. But more disturbing is the fact that the so-called “recovery” since then, a recovery that hasn’t gotten us back to the beginning, is itself running out of steam. The curve is flattening in 2011. That’s because the rage in Washington by both Republicans and the President has been for budget-cutting. Budget cutting is contractionary fiscal policy. They’re trying to slow down the growth of an economy that’s pretty much already run out of steam.